Kegels are the best way to keep your pelvic floor in tip top condition, but there are supplements that work alongside Kegels to make your pelvic floor even more strong and healthy. Here at Kegel8 we are always looking at ways to improve the pelvic health for both women and men and during our decades of research we have gained some fantastic knowledge, that we have spread far and wide in the hopes that the taboo of the pelvic floor will be crushed! Our latest research has included looking at supplements that will help to improve the pelvic floor and after many months of searching we have found the ideal ones to go alongside your pelvic floor exercise routine. Oregano Oil is a strong anti-fungal, so it helps with the build-up of candida (yeast) which can cause thrush (in women) and balanitis (in men). It is also a powerful antioxidant and due to its antibacterial properties, it is used by herbalists to treat gastro intestinal and respiratory disorders, particularly upper respiratory tract infections. Power Dophilus is a non-dairy, pro-biotic formula providing a natural source of 3 billion live, friendly bacteria. Friendly bacteria help to balance the intestinal flora and encourage healthy bacteria to grow in the gut. Power Dophilus is known to ease symptoms of IBS and candidosis (thrush) and is suitable for those with a lactose intolerance. Vitamin C is one of life's most important nutrients, it is a powerful antioxidant and is one of the bodies best defences against excess free radicals caused by smoking, stress and pollution. Because the body cannot store vitamin C it is vital that you get the recommended daily intake via your diet. Vitamin C plays a primary role in the formation of collagen, which is required to keep organs and other structures in place in the pelvic area. Vitamin C also aids tissue healing, which could help with prolapse. 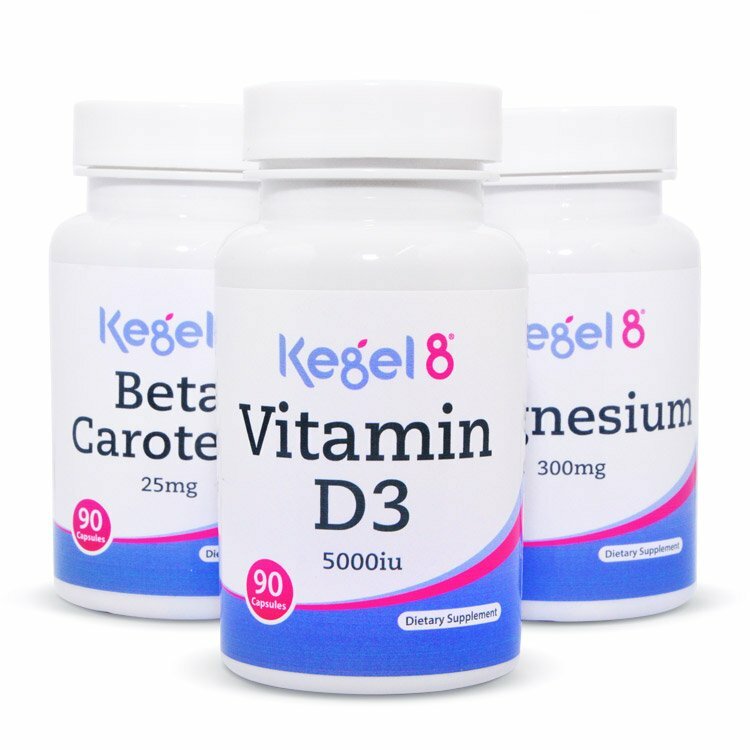 Vitamin D3 is ideal to be taken alongside your Kegel8 routine as it helps decrease pain sensitivity for chronic pain and protects against muscle wastage, helping the pelvic floor stay strong and healthy. A study which took place at Botucatu Medical School at Sao Paulo State University in Brazil, found that consuming enough vitamin D may be able to reverse the muscle loss that most women typically experience after they go through the menopause. Vitamin D has been shown to increase skeletal muscle efficiency at adequate levels. The levator ani and the coccygeus pelvic floor muscles are skeletal muscles and are crucial to supporting the structure of the pelvic floor. Pelvic floor musculature weakness can contribute to pelvic floor disorders such as urinary or faecal incontinence and pelvic organ prolapse. *We also have vitamin D3 in spray form. D - Mannose is a simple sugar molecule found in fruits such as cranberries. When D - Mannose is present the bacteria attaches itself to it rather than to the bladder wall and can be used to flush out 90% of urinary tract infections and associated symptoms such as pain and discomfort. It can also be consumed at relatively high levels as a food supplement to actively remove E.coli during an infection. Magnesium is an essential mineral for the growth and maintenance of the body's organs, nerves and blood. Magnesium is ideal if you suffer with pelvic pain as it will help relax your pelvic floor muscles and reduces bladder spasms. It can also lower blood pressure, balance hormones, help with digestion and lower the risk of constipation. It is also known to alleviate morning sickness and reduce the risk of the child having cerebral palsy and SIDS (sudden infant death syndrome) if taken during pregnancy. Collagen is the "glue" that keeps our bodies together! It is found in muscles, bone, skin, cartilage, blood vessels, digestive system and tendons. Collagen production slows down as we age (from just 30 years old!) creating signs of ageing such as joint pains, sagging skin and it affects the pelvic floor muscles. To keep the pelvic floor strong and healthy, collagen is a must as it strengthens the ligaments enabling the pelvic floor musculature to contract. Epsom salt is a natural exfoliant and anti-inflammatory that is most commonly used in the bath to treat muscle and joint, aches and pains. Although it is called a salt it is a lot different from most salts as it is actually a mineral compound of magnesium and sulphate. Although using Epsom Salts doesn't directly benefit the pelvic floor it does address some of the issues that can be causing the muscles problems. Beta Carotene is a carotenoid, widely distributed in fruits and vegetables forming part of their natural yellow and orange pigment. Beta Carotene is also a natural precursor to vitamin A which when digested releases vitamin A into the system. Vitamin A provides numerous benefits for the body and in turn the pelvic floor. Mega H40 is a fantastic one-a-day multi-vitamin and mineral plus complex with each capsule containing over 40 active ingredients!